Highly Potent Fat Burner From The Mad Chemist! Highly Potent Fat Burner From The Mad Chemist!Highly Potent Fat Burner From The Mad Chemist! 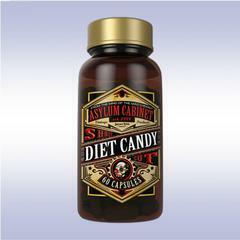 Diet Candy is the most potent fat burner ever created by the Mad Chemist himself. The unique look and feel are modeled after The Mad Chemists first ever creations back in 1898. Diet Candy is only for those 18 and older and a strict warning of only 2 capsules per day is not to be taken lightly. Once you try Diet Candy you will not want to try another diet product again because nothing can compare to what the Mad Chemist has cooked up this time.